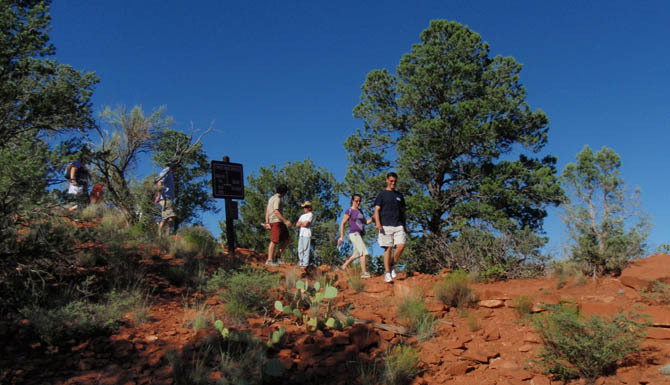 Our Sedona, Arizona guided day hiking tours can be scheduled for either a half or a full day. These hikes will take you into a gem within the Red Rock, with shaded oasis-like trails along Oak Creek where we travel along small foot bridges providing you with a sense of peace and well-being, as well as predominant ridgeline trails that offer some of the best views of the Sedona area. Seeing these spectacular views of the Red Rock can be life changing, it is incredible the way time, water and wind created such an incredible landscape. At all of our hiking locations, we are a LEGAL permitted hiking guide company with the US Forest Service, allowing us to take you into many areas off limits to other companies. On certain hikes it is not uncommon to see desert wildlife, as the area along the vegetated Oak Creek draws in animals from around the Red Rock area. On other hikes we may see ancient pictographs from Native people 1000 years ago. Our local guides will provide information on flora and fauna along the way, as well as explain the local geology and history of the Sedona area. If you are looking to hike the Red Rocks, our locations can provide you with views of the entire surrounding Sedona area, or of the diversity of a desert riparian creek. - Includes guides, transport from your hotel, backpacks, snacks, entrance fees, drinks and tax. - Includes guides, transport from your hotel, backpacks, gourmet lunches, snacks, entrance fees, drinks and tax.